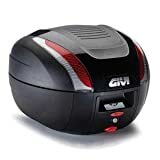 I’ve been a fan of Givi cases for many years. 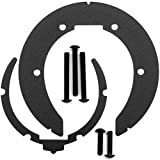 The first set I used on three bikes—I sold them with the third bike—and the second set is currently on its fourth bike. I like their sturdiness, and the ease with which they can be attached or removed from the bike. The new Trekker cases solve problems in a clever way, without compromising the basic goodness they inherit from the earlier cases. Most of Givi’s cases have a utilitarian look to them, but the Trekkers look a lot like the cases that come on high-buck European adventure bikes like BMWs and KTMs. When you open them you almost expect to find a handful of Kalahari sand in the bottom. 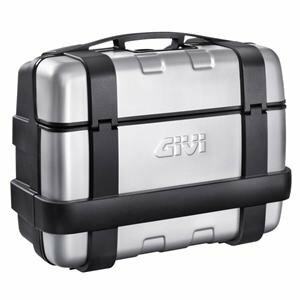 They’re made of the same tough polypropylene material as Givi’s other cases, with aluminum accents. But the real news is in the lid design. The Trekkers have a two-way lid that can be opened like a conventional side case in one mode. But inside each case is a pair of levers that you can use to convert the side-opening case into a top-opening case. 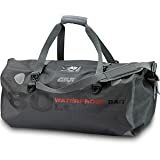 This is particularly handy if you’re a packrat like me, and you’re tired of having to pick the contents of your overstuffed case off the ground every time you open it to look for something. With the cases in their top-opening configuration, I can drop things into them without having to jam other things back in place before closing the lid. Good stuff. Well put together. Easy to install with the additional plate that attaches to a luggage rack, which is also separate. Nice size for me.